Blog » News & Events » 5 countries, 3 languages, 2 continents and 1 platform – Sage One! 5 countries, 3 languages, 2 continents and 1 platform – Sage One! 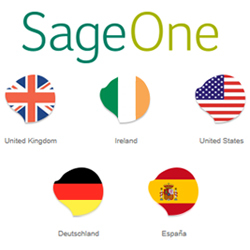 In April 2013, we added two new countries to the Sage One family – launching Sage One Germany on 8th April and Sage One Spain on 29th April. As the title of this blog suggests, this means that our Sage One Accounts software is now available in 5 countries, 3 languages and 2 continents – UK, Ireland, USA, Germany and Spain! When I joined the Sage One UK team at the end of November 2012, we already had the UK, Ireland and USA online, but it’s exciting to see the two latest additions come onboard in such quick succession with more countries due to follow soon. Our amazing developers have been hard at work rebuilding Sage One behind the scenes which means that instead of being individual, localised pieces of software, each country now shares a single, global codebase so they can pick and choose which elements they wish to add or unlock for their customers. The potential is now there for Sage One to be used in every major economy around the world so watch this space as we gain momentum with our rapidly growing customer base of start-ups and small businesses. If you’re a developer with global ambition, now is the time for you to join our Partner Programme and build something great for our users with our API.